Enjoy luxurious high-rise living at Portofino Island Resort, a condominium resort that is located on the Gulf of Mexico and the Santa Rosa Sound. It consists of five individual towers featuring their own lobby, pool and hot tub. Each unit has professionally designed interiors, balconies featuring elegant columns with built in grills, water views from every room, and Roman whirlpool baths. These features only begin to describe Portofino’s distinct Mediterranean feel. This beautifully furnished 1,330 square foot unit features king size beds in both the master and guest bedrooms with top of the line mattresses for your ultimate comfort. The leather sofa also contains a queen size sleeper. Living and bedrooms offer both TV’s and DVD players. A fabulous kitchen, complete with granite countertops, offers upscale appliances (including a waffle iron) with all the necessities for even the most discriminating chef to cook a gourmet meal with. The dining area features a Greek style table with seating for six and three bar stools at the breakfast bar for additional seating. 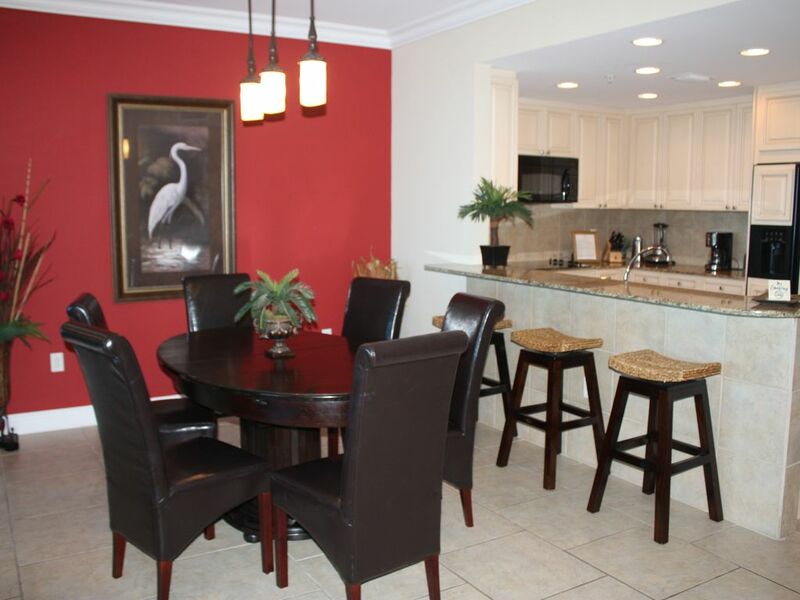 The kitchen, dining and living area features an open floor plan for your comfort and enjoyment. A half bath is conveniently located in the foyer. There are remote controlled ceiling fans in the living and bedrooms that help maintain comfortable temperatures. The master bathroom has a custom glass walk-in shower, a Jacuzzi tub, his and her sinks, with a separate toilet area. Both bedrooms have their own balcony access. The unit has a washer and dryer as well as free wireless internet. There is one covered parking spot and additional parking nearby. While sitting on the balcony, enjoy the views of the sound, gulf and the Lifestyle Center. The Lifestyle Center entertains with views of two pools, a bar and occasional live entertainment, not to mention water sports that take place on the sound. At the Lifestyle Center, pamper yourself at the Spa Portofino that offers customized body treatments, facials, full body massages, manicures and pedicures. These services can also be enjoyed from your room or poolside. The Lifestyle Center also features a 25-meter indoor heated Olympic pool with a soaring wood–beamed ceiling overlooking the sound. It also contains a state-of-the-art Fitness Center, two outdoor zero-infinity pools, whirlpool spas, saunas and steam rooms. At the Lifestyle Center you can enjoy fine dining in the Terracotta Restaurant and Cobalt Bar. The restaurant provides a unique dining experience, serving continental cuisine with a touch of Mediterranean and Italian influence. The lush outdoor pavilion has a full service bar and grill for your needs as you enjoy the two pools. The Fitness Center allows you to view the sound as you work out on treadmills, elliptical trainers, and stairclimbers each of which has its own cable TV or DVD player. It has various weight machines and free weights with personal trainers, pilates classes, spin classes, yoga classes and water aerobics. For the athletic minded, there are five lighted Rubico (clay) tennis courts. For the water sports activist, many water sports are available for both shorelines. These include on site rentals for jet skis, kayaks, sailboats, boogie boards, water bikes and even a water trampoline for the kids. There are also bike rentals and hiking on the Gulf Island National Seashore’s paved trails. What more can a family ask for. There’s something for everyone. Rental service is also available to have your beach chairs and umbrella set-up for you when you arrive on the beach. If guests would rather shop, they can board a 65 foot Catamaran which travels to and from the Boardwalk, an exciting entertainment, shopping and dining area. Relax and revitalize you spirit at Portofino Island Resort and Spa. Paradise awaits you. My name is Renee Harrell. I am an entrepreneur from Louisiana that owns and runs various businesses. I take great pride in my unit and provide a clean, upscale environment that renters would expect in a vacation home. The beauty of this resort is amazing. You have a complete view of the bay, the gulf and the overall resort. The entire resort pays close attention to detail. It is very easy to get to and is not as crowded as other areas like Destin or Gulf Shores. You can simply stop at the grocery store or Joe Patti's (huge seafood market), go to the unit and never leave. If you prefer to eat out, there is a restaurant and grill on site in the Lifestyle Center. Once at the resort, you will not want to leave. The resort has a total of eight (8) pools. Each tower has it's own private pool and the Lifestyle Center has two outdoor and one indoor Olympic size pool. The Lifestyle Center also serves food and drinks as you relax, features a outdoor and indoor bar and offers occasional live entertainment on weekends. Another plus is you can see all this activity and hear the music from my balcony. If you prefer the beach, there is constant tram service that will give you a lift or you can walk. It is not far. Chairs and umbrellas are rented for a nominal fee. They have recently starting serving food and drinks on the beach. If you enjoy boating, Portofino has its own catamaran that runs throughout the day and night and will take you to the Boardwalk for dining and shopping. The resort offers lots of activities for children. It has a blow up waterpark and many different planned activities. Back in the Lifesyle Center, the fitness club is fabulous and offers lots of classes or you can be pampered at the Spa with a full range of services. I could go on and on and on. This place is GREAT!!! The condo is absolute perfect! Thanks for an enjoyable week at Portofino! We will definetly be back! We have stayed at this resort for years and always enjoy ourselves. The children just love it and there are lots of activities. Very quiet. Great staff. Wonderful service. Nice atmosphere. Kid friendly. Would go again. Well maintained & bery clean! Great view! We absolutely loved staying at the Portofino! The condo was beautiful and had everything we needed. Renee was awesome and responded quickly! We are already planning our next trip and hope to stay in 1802/Tower 4 again. Hospitality was great and plenty to do for kids! Condo was beautiful, clean, well stock with cooking utensils etc. The property is beautiful but a bit pricey for extra activities for the kids or drinks, food etc. Holiday and Event rates are $250-350 per night.